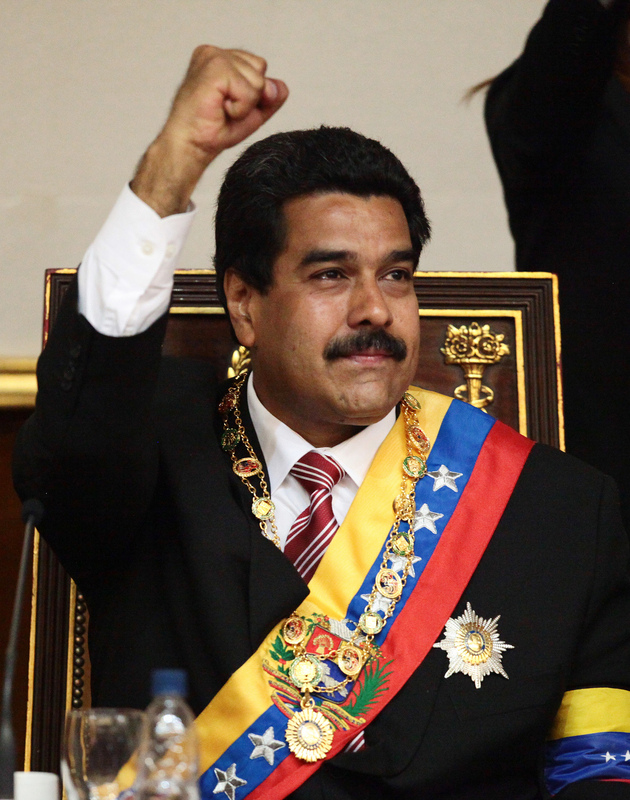 A recent survey conducted by the Venezuelan polling firm Datánalisis reveals that the popularity of Venezuelan President Nicolás Maduro now stands at about 22 percent (El Universal 2014). Maduro won the presidential election in April 2013 with 50.6 percent of the vote - an extremely thin margin compared to the impressive electoral performance of his predecessor – Hugo Chavéz. Ever since, negative public assessment of Maduro is on the rise. How can we explain such a drop in the popularity of Maduro - successor of the immensely popular late Venezuelan leader and a strict adherent to his political legacy? Hugo Chávez won four consecutive presidential elections, mobilizing ever-increasing public support. Yet, the current public mood indicates that an eventual re-election of Maduro, and for that matter, the future of Chávez’s political project known as the ‘Bolivarian Revolution’, is uncertain. Chávez aimed at profoundly transforming Venezuela’s political and socio-economic structure by blowing up the traditional two-party system that was in place during the second half of the 20th century, known as the “Fourth Republic.” In addition, he implemented numerous social development reforms and programs that lifted millions of Venezuelans out of poverty and educated large parts of the previously illiterate population. At the same time, sections of the middle and upper classes grew impatient with the state-centered economic policy introduced by the Chávez administration, the soaring levels of violent crime and the intimidation of the political opposition. As a result, by the end of Chávez’s rule, Venezuelan society was deeply polarized. Following a period of political alienation during the 1990s, Venezuelans became increasingly politicized during Chavéz’s rule: many citizens participated in political rallies, with numbers on the rise for both pro-government and opposition demonstrations. More importantly, voter turnout at elections increased tremendously, from 6.2 million voters in 1998 to over 15 million in the 2012 and the 2013 presidential elections. This impressive electoral mobilization merits detailed empirical investigation. Our study examines how the weakened and fragmented right-wing opposition was able to substantially increase its electoral mobilization potential after 2000, and with every presidential managed to boost their vote share, narrowing the gap between the incumbent and the challenger. In 1998 Chávez received around 3.7 million votes, while the opposition was able to muster only 2.6 million. By 2006 Chávez increased his net support to 7.3 million votes, with the opposition trailing way below 5 million votes. Yet, while Chávez total tally vote topped 8 million in 2012, the opposition vote stood just above 6 and a half million. Nevertheless, in the 2013 election, over 7 million voters supported the united opposition, narrowing the gap to just over 220.000 votes. Taking into account that Chávez experienced his only electoral defeat in a 2007 constitutional referendum, one would not expect such an impressive performance by the opposition. The latter gained strength by widening its social base of support, even successfully appealing to lower social strata voters in former chávista strongholds. How was it able to do so? To answer this question we utilize two datasets – a representative dataset by the Latin American Public Opinion Project (LAPOP) and large-N opt-in data from the Voting Advice Application (VAA) “Brujula Presidencial” http://www.brujulapresidencial.org /. We find a similar pattern in both datasets – a large number of voters who stated that they voted for Chávez in the 2006 presidential election, expressed a vote intention for the opposition in 2012. The majority of those who abstained in 2006 also indicated that they would vote for the opposition. This increasing electoral appeal and competitiveness of the opposition can be explained – at least partially - by increasing anxiety over economic performance, despite high levels of government spending on social programs and increased consumption. Normally, under relatively favourable economic circumstances one would not expect increase in opposition support. Therefore, we test whether the increased popularity of the opposition was driven by negative evaluations of policies implemented by the Chávez government. Conventional wisdom and empirical evidence suggest that public opinion regarding incumbent performance in various realms of socioeconomic policy affects electoral outcomes. We look at three particular policy domains that might explain the increasing appeal of the opposition: evaluations of the economy, concerns with public safety, and satisfaction with Venezuelan democracy. Numerous studies show that objective economic conditions, such as economic growth or decline, inflation and unemployment levels, influence the level of incumbent support (Kinder & Kiewiet 1981; Lewis-Beck 1988). Chávez’s economic record is mixed and controversial. He implemented the nationalization of the crucial economic sectors and advocated strong state presence in economic governance with the aim of diversifying the oil-based economy. Chávez’s supporters point to the level of annual GDP growth of over 3 percent per annum since 2000 (Johnston and Kozameh 2013) and the drastic reduction of poverty from 54 percent of all households in 2003 to 26 percent in the end of 2008, while extreme poverty was reduced by an impressive 72 percent (Weisbrot et al. 2009). Opponents point out, however, that the Venezuelan economy went into a recession in 2009-2010 as an effect of the global economic crisis, but also because of domestic economic mismanagement. Moreover, the Venezuelan economy is infected by one of the highest inflation rates in the world averaging about 29 percent in 2010. Even though the economy recovered somewhat in 2012 and grew with almost 5 percent, scarcity of basic products and goods remains a serious concern for the population at large. The legitimacy of governments and political leaders in an environment of rising crime levels will be strongly influenced by policies aimed at fighting crime. In particular the performance of the police is crucial for citizen’s evaluation of public safety (Perez 2003). Moreover, crime levels and police performance fundamentally affect the character of democratic development as crime rates have enormous social and economic effects (Bailey 1995). If large sections of the population feel unprotected or even become a victim of the system that is supposed to protect them, evaluations of the country’s political leaders plummet. In such cases “the attention of the middle and upper classes focuses on the failings of the police and criminal justice system” (Perez 2003, 628). Analyzing Venezuela’s party system collapse, Morgan (2011) found that as long as the ruling parties addressed the most salient voter concerns, they maintained the legitimacy to govern again. However, when incumbents failed to respond to the most pressing policy-issues, such as safety, voters were likely to support the opposition, particularly if the alternative was associated with a different ideology and vision for the country’s development. With crime rates at unprecedented levels, public safety and the rise of violent crime have become major issues in Venezuela that could crucially impact the level of opposition support. With large sections of the population feeling unsafe or falling victim to crime, the legitimacy of the incumbent government declines. Even in traditional poor urban pro-Chávez strongholds, such as Petare in Sucre (Caracas), support for the Chávez administration declined due to high crime rates (Ocando 2009). After a chávista Mayor had governed the municipality for two terms, a candidate of the right-wing Primero Justicia party won the mayoral elections in 2008, due to widespread dissatisfaction with social conditions and political corruption (Hetland 2012). While some argue that Venezuela is more democratic than most of its neighbors (Motta 2009; Wilpert 2007), other observers characterize Chávez as an authoritarian populist, who undermined Venezuelan democracy (Mayorga 2006; Castaneda 2006). Using an unmistakable anti-elitist rhetoric, the former president often claimed that only he could represent the interests of the common people. Chávez emphasized popular sovereignty and relevance of the popular will over the rights and freedoms of individuals. Against popular conception, Chávez did not only mobilize the poor, but initially appealed to a substantial number of voters from the middle and upper classes (Canache 2004, 46). However, the chávista voter base was transformed from multiclass in 2006 (Lupu 2010) “into a mostly bipolar rather than multi-sectoral coalition”, as the populist character of Chávez’s electoral strategy deterred the middle classes, yet appealed to urban workers and peasants, as well as elites within the military and newly enriched Venezuelans (Corrales and Penfold 2011, 146). The polarization over the democratic character of Venezuela is based on Chávez’s project ambition to include the less fortunate and less educated sectors of society into the decision-making process by attempting to replace traditional liberal democratic institutions with alternative forms of participatory democracy, characterized with popular bottom-up participation in local decision-making. For many, however, the Bolivarian Revolution entails numerous instances when liberal democratic freedoms were curbed by the Chávez administration (Kornblith 2013). Although the revolution brought about significant participatory initiatives and lengthened the rights of previously excluded social groups, it has also tilted the electoral process in favor of the incumbent. Intimidation of opposition supporters became systematic, a prominent example being the publication of the names of those who signed the petition for a 2004 recall referendum aimed at ousting Chávez. Moreover, after opposition candidates won governorships in key Venezuelan states, the Chávez administration introduced centralized management of ports, hospitals, highways and airports. National media came under ever tighter monitoring and broadcast controls. Most importantly, Chávez often circumvented parliamentary approval of proposed laws by ruling through presidential decrees. Concern with the erosion of liberal democracy in Venezuela may have deterred voters from supporting chávismo (again) and could have boosted support for the opposition among those most concerned with individual freedoms and civil liberties. In addition, moderate voters may be swayed by the political intolerance of staunch supporters of an incumbent: in a comparative study, Carlin et al. (2013, 232) found that those who voted for a winning presidential candidate and benefitted from the new regime were also “less likely to tolerate dissenting elements within society”. Using regression analyses, we test whether economic perceptions, security concerns and democratic evaluations have an impact on the 2012 vote intention of those who voted for Chavez in 2006 and those who abstained. The findings confirm that negative economic perceptions, the inability of the Chávez administration to improve public safety, and the belief that liberal democratic principles are under threat, all drove voters into the opposition bracket. We find strong effects among voters who abstained in 2006, which explains the basis of the impressive electoral mobilization in Venezuela - many former abstainers started to support the opposition. The united opposition also convinced many former chávistas to switch sides. This allowed them to narrow the electoral gap substantially. Chávez’ nationalization of crucial industries, the mismanagement of economic diversification, the inability to deal with high crime levels, as well as his increasingly autocratic style of government have resulted in a legitimacy drop for his political project, which has apparently accelerated after he passed away. While through his personal appeal Chávez was able to shield himself, to some extent, from negative socioeconomic evaluations and still rally an increasing number of voters with every next presidential election, the deteriorating socioeconomic conditions most Venezuelans face today, and the government’s measures against prominent opposition figures, are the most likely cause for its crumbling popularity. Bailey, D. H. (1995) A Foreign Policy for Democratic Policing. Policing and Society: An International Journal 5, 2: 79–93. Canache, D. (2004) Urban Poor and the Political Order. In The Unraveling of Representative Democracy in Venezuela eds. J. L. McCoy and D. J. Myers. Baltimore: Johns Hopkins University Press. 33–49. Carlin, R. E., M. M. Singer, G. J. Love, D. Zizumbo-Colunga, and A. E. Smith (2013) Political Legitimacy and Democratic Values. Chap. 6 in The Political Culture of Democracy in the Americas, 2012: Towards Equality of Opportunity, eds. M. A. Seligson, A. E. Smith, and E. J. Zechmeister. Nashville: LAPOP. 189–216. Castañeda, J.G. (2006) Latin America's Left Turn. Foreign Affairs 85, 3: 28–43. Corrales, J. and M. Penfold (2011) Dragon in the Tropics: Hugo Chávez and the Political Economy of Revolution in Venezuela. Washington, DC: Brookings Institution Press. El Universal (2015) ‘Director de Datanálisis revela que popularidad de Maduro cae a 22%’ At:http://www.eluniversal.com/nacional-y-politica/150102/director-de-datanalisis-revela-que-popularidad-de-maduro-cae-a-22 (27-02-2015). Hetland, G. (2012) The Crooked Line: From Populist Mobilization to Participatory Democracy in Chávez-era Venezuela. Paper presented at the 30th International Congress of the Latin American Studies Association, San Francisco, May 23–26. Johnston, J., and S. Kozameh (2013) Venezuelan Economic and Social Performance Under Hugo Chávez, in Graphs. CEPR. At: http://www.cepr.net/index.php/blogs/the-americas-blog/venezuelan-economi...ávez-in-graphs (08-04-2013). Kinder, D. R., and D. R. Kiewiet (1979) Economic Discontent and Political Behavior: The Role of Personal Grievances and Collective Economic Judgments in Congressional Voting. American Journal of Political Science 23, 3: 495–527. Kornblith, M. (2013) Chavismo After Chávez? Journal of Democracy 24, 3: 47–61. Lewis-Beck, M. S. (1988) Economics and Elections. Ann Arbor: University of Michigan Press. Lupu, N. (2010) Who Votes for Chavismo? Class Voting in Hugo Chávez's Venezuela. Latin American Research Review 45, 1: 7–32. Mayorga, R. A. (2006) Outsiders and Neo-Populism: The Road to Plebiscitary Democracy. In The Crisis of Democratic Representation in the Andes, eds. S. Mainwaring, A. M. Bejarano, and E. Pizarro. Stanford: Stanford University Press. 132–67. Morgan, J. (2011) Bankrupt Representation and Party System Collapse. University Park: Pennsylvania State University Press. Motta, S. C. (2009) Venezuela: Reinventing Social Democracy from Below? In Reclaiming Latin America: Experiments in Radical Social Democracy, eds. G., Lievesley and S. Ludlam. London: Zed Books. 75–90. Ocando, C. (2009) Caracas' Neighborhood Petare is Voice of Chávez's Poor Opposition. Miami Herald, February 22. Pérez, O. J. (2003) Democratic Legitimacy and Public Insecurity: Crime and Democracy in El Salvador and Guatemala. Political Science Quarterly 118, 4: 627–44. Weisbrot, M., R. Ray, and L. Sandoval (2009) The Chávez Administration at 10 Years: The Economy and Social Indicators. Washington, DC: Center for Economic and Policy Research. Wilpert, G. (2007) Changing Venezuela by Taking Power: The History and Policies of the Chávez Government. London: Verso.